It was my absolute pleasure to spend the far too short month of April here at Elsewhere Studios. Coming from a lifetime spent on the east coast the mountains were a beautiful and refreshing change of pace. To best illustrate the amazing and rejuvenating experience I have had here in the charming town of Paonia; I am going to break my post up into a few sections so I don’t completely ramble and bore you all. 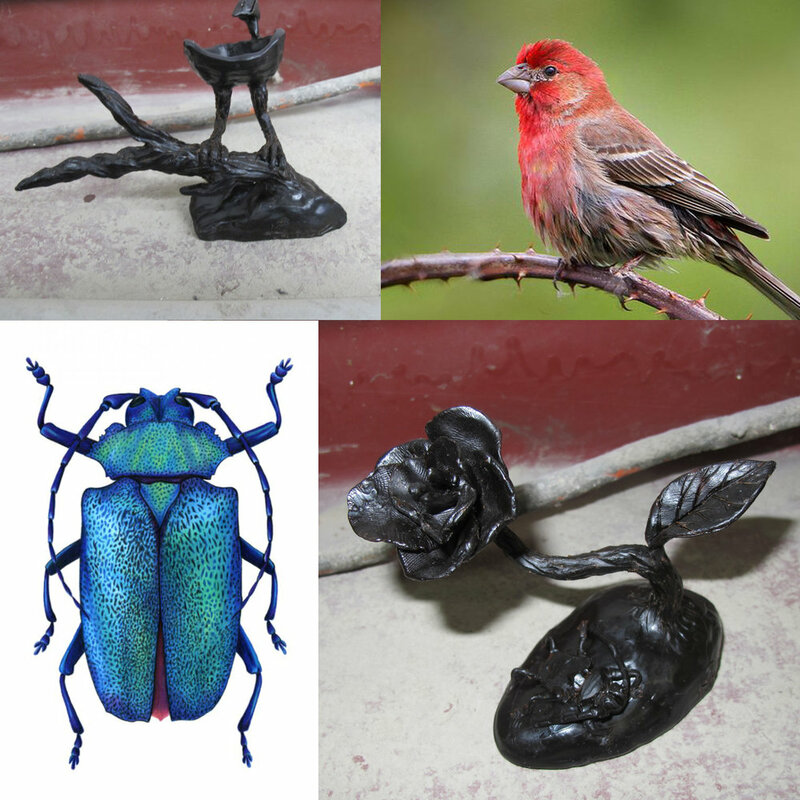 Knowing that I only had one month to produce a body of work, and being that I had to fly instead of driving I was unable to bring torches and materials I would generally use to create metal work or jewelry, in the week or so before leaving for Colorado I began to plan and pattern the installation I intended to create. I am currently in the process of pursuing a masters degree in Art Therapy, so I have been reading and researching a lot about the techniques and theories associated with becoming an Art Therapist. In doing so I stumbled upon Robert Plutchik’s theory of the emotional wheel, which is similar in appearance to a traditional color wheel accept each color is assigned an emotion. I thought this concept would lend itself well to creating a series of hand bound leather journals & masks dyed and arranged to imitate the emotion wheel. I began by patterning the leather journal covers and then through a process called Pyrography I burned the name of the emotion, its definition, and synonyms into the surface of the leather. Once all the text was seared into the covers they were each hand dyed with Fiebings leather dyes. The masks were also patterned, cut, burned, baked to create shape, and dyed to match the corresponding Journals. The journals were then lined, stitched, and the hand cut watercolor papers were carefully bound with black wax thread. Once all the books were bound I began to arrange them and couldn’t decided if I liked the masks laid on top of its corresponding journal or to invert the masks for conceptual reasons. Artist Statement: In art therapy, journaling is a tool commonly used to help patients to further express their emotions. 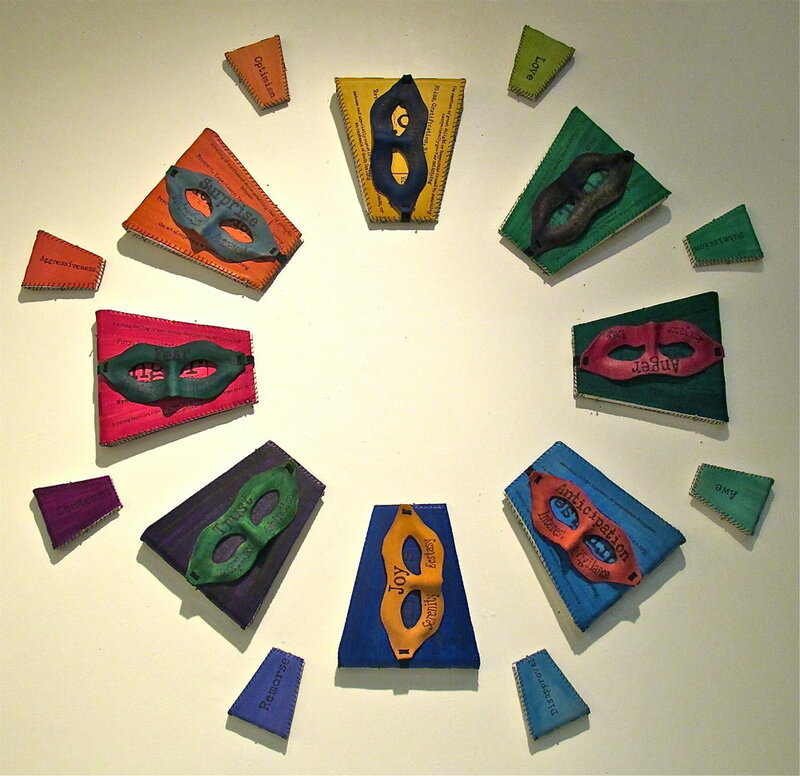 This series of hand bound leather journals and corresponding masks are arranged as a wall installation inspired by Plutchik’s theory of the emotion wheel. The emotion wheel was developed to help therapists identify how someone’s use of color relates to their feelings toward the subject they are creating. Using the technique of Pyrography, text has been burned into the surface of the leather covers and masks. The leather is then hand dyed and utilized to represent the different emotions of the psychology-based wheel. In the installation the masks are inverted and sit on top of the journal that conveys the opposite emotion, thus highlighting the duality of emotion and how the feeling we portray on our face is often not the emotion we are experiencing. Part 2: The People of Paonia & The Foundry! First let me say how welcoming and incredible the people in this town are. The place is bursting with talent and it is such a beautiful thing to be surrounded by creative individuals it is simply inspiring. Also did I mention the view! I swear every picture I take of the scenery looks like a post card, and I am not a good photographer. My first week I was lucky enough to meet Liz from the Remedy Café and when I described my tale of woe about not getting to bring my metalworking supplies along on my journey, she mentioned that her father and brother owned the local FOUNDRY!!!!! I couldn’t contain my excitement and I called her sister –in-law, Nancy, the next day and she very graciously picked my up and gave me a little tour of the facilities. I have to throw out a blurb about the beautiful ladies who were my roommates and partners in creative crime. I could fill another ten paragraphs with quirky anecdotes and tales of debauchery, but instead I will just say thank you and hope they know what a gift it was to spend a month laughing and creating with them! Another big thank you to Sharon & everyone who have made Elsewhere the truly magical place that it is! Keep up the good work!